Love that classic video of polar bear cub learning to walk? Baby bat eating banana? Dog dressed as mutant spider?!? Brace yourselves, netizens. On Thursday, you can chat with a month-old African penguin in a Google Hangout. It’s like you’re in the viral video. This Thursday, June 4 at 1 to 1:30 p.m. EST, log onto “Ask a Penguin Chick” and chat with Curry, the newest aquatic fowl at the California Academy of Sciences. He’ll be joined by his posse of biologists who can answer your questions about Curry’s species, the African penguin. (Or general questions about penguins.) Curry’s species, though, was classified as endangered in 2010—and faces extinction in the wild. RSVP to the event here, where you can also submit questions. You can also ask on the Facebook page. 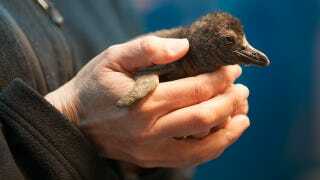 Curry’s the fourth African penguin chick to hatch at the Bay Area-based Academy this year. The Academy is known for breeding the species—its colony is part of the Species Survival Plan. Never heard of it? Organized by the Association of Zoos & Aquariums, it’s an initiative that keeps genetic diversity intact via controlled breeding. AZA members—zoos and aquariums in the US and Canada—can exchange the animal offspring. Some endangered species the program includes are the giant panda, California condor, and lowland gorilla. So submit questions, Gizmodians. You’re an inquisitive bunch. You can skip one question, though. His namesake? It’s Golden State Warriors point guard, Stephen Curry.